Want to know what’s the best exercise to lose weight and gain muscle? Read on. Less than 5 percent of adults get at least 30 minutes of moderate-intensity every day. That’s the bare minimum that’s recommended to reduce risk for overweight, heart disease, type 2 diabetes, certain cancers and much more. While there are many excuses for not exercising, lack of time is the number one reason people skip out of moving more. Now, new research reveals which exercise is best to slim down and tone up and good news, it takes less time. Intense, sweat-drenching workouts may be best to put your metabolism into overdrive for the next 14+ hours, according to a new groundbreaking study. In addition, other studies show that going at all-out or close to all-out efforts for short duration intervals improved aerobic capacity better than longer duration moderate intensity exercise–in half as much time! The evidence is overwhelming showing that high-intensity interval training (HIIT) is best to get fit fast and torch calories. The study, published in the American College of Sports Medicine’s peer-reviewed journal, Medicine & Science in Sports & Exercise used a metabolic chamber (the gold standard for measuring energy expenditure) at the University of North Carolina. The researchers enrolled 10 male subjects aged 22-33 years old. On the test day, subjects exercised vigorously on a cycle ergometer in the a.m. at 70% of their VO2max for 45 minutes. The researchers were able to monitor the subjects’ metabolic rates, energy intake and expenditure over the next 24 hours while they were in the chamber. The subjects also completed a comparison 24-hour period in the metabolic chamber with no a.m. exercise to compare differences in energy expenditure between the exercise versus non-exercise days. The researchers found that the men burned some 519 calories during the 45-minute exercise session and then burned another 190 calories from the exercise in the next 14+ hours. The researchers calculated that the vigorous exercise session plus the post-exercise increases in metabolism equaled about 750 calories over the 24-hour period. If you completed a 45-minute walk, you’d burn about 250 calories and experience no increases above baseline in metabolism post-exercise. Spending your 45 minutes going harder can result in burning 3 times as many calories over a 24-hour period. If you think you’re too out of shape for this type of workout, you’d be wrong. “We found that even the subjects who were overweight and out of shape reaped the same benefits. So unless your doctor says you cannot do vigorous exercise, this is something most people can do and could have an impact on achieving a healthier weight,” concluded Neiman. However, one thing that can undo all the good of this metabolic effect is if you think you can “reward” yourself with food after you’ve crushed your workouts. It’s too easy to eat hundreds of calories with just a few bites of something decadent so it’s always best to stick with your diet + intense exercise if you really want to see results. There’s no free lunch when it comes to getting fit and lean. Do whatever exercise you like that you can really push yourself to the point where you’re seriously sweating and it’s impossible to carry on a conversation. Try boot-camp style workouts, Crossfit, a spin class or track workouts. 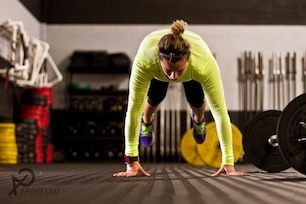 There are numerous websites devoted to CrossFit travel WODS (workouts of the day). These WODs generally require no special equipment and are usually anywhere from 5 to 15 minutes in length. They’re never boring and will be over before you know it. For more about CrossFit, read this.